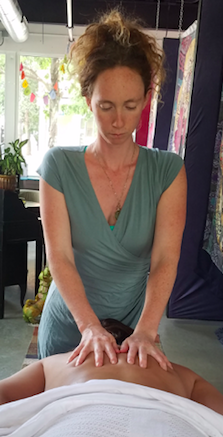 Wildflower Healing Arts specializes in massage therapy for all ages and all body types. Madison, LMT specializes in craniosacral massage, deep tissue, swedish, myofacial, cupping and pet massage. Wildflower also uniquely blends massage therapy with the knowledge of midwifery to offer prenatal and postpartum massages for mothers. We are so thankful for the ability to support mothers through the transformational process of child birth. Touch is an essential form of communication, a language deeper and more ancient than words. We as human creatures need safe and nurturing touch to thrive. I use my massage therapy practice to meld the modern science and skill of touch with this more ancient lineage of communication. Each session is a unique journey to discover and tend the places in your body that can most use attention. Enter the sanctuary and experience the magic and power of this alchemical combination of skill and Spirit. Being a midwife led me to see intimately how important body-centered nourishment and support are for young and growing families to thrive throughout the pregnancy, birth, postpartum, and new-parenthood cycle. I’m grateful to offer a combination of body work modalities with the sacred knowledge of midwifery to support my community through this amazing (and sometimes exceedingly stressful!) time. I’ve found that engaging healing and professional touch throughout the childbearing continuum helps to deepen the profound transformation that are emerging through the process. Massage therapy is a powerful tool for promoting well-being for all people, and I’m happy to be able to serve the community in this way. All are welcome! Our massage studio can be found at 3970 Broadway St Unit 201C in Boulder Colorado. Or ask about receiving massages in your own home. *Massage Therapy delivered to your home for an additional travel fee!